This quote is mentioned in the book Einstein: His Life and Universe from 2007. There is certainly a quote within a purported interview with Einstein in which the phrase appears and is attributed to Einstein (see Morgoth's answer). As such, the claim can be considered one that existed during Einstein's life, and is not a posthumous invention. I have repeatedly said that in my opinion the idea of a personal God is a childlike one. You may call me an agnostic, but I do not share the crusading spirit of the professional atheist. ... I prefer an attitude of humility corresponding to the weakness of our intellectual understanding of nature and of our own being. These letters, in Einstein's own hand, portray a man who considered the Bible and its contents to be stories rather than historical facts, who took religion in general to be questionable, and whose belief was often misrepresented by others. So on content, there is reason to doubt an interview in which Einstein claims to be a Jew (in context, clearly referring to religion rather than culture - he was culturally Jewish), enthralled by Jesus, and so certain of the truth of the Bible's description of Jesus's life that his existence is "unquestionable". In an interview between a German (Einstein) and a German-American (Viereck), it seems odd that the French phrase "bon mot" would appear so casually. Use of a term like this in English is generally done for oratory purposes, to make the words sound more grand; this is at odds with the context, in which Einstein is allegedly criticising others for using "witty remarks" (the meaning of "bon mot" when used in English) to dismiss Jesus's existence. More generally, the wording of Einstein's answers is particularly colourful, using phrases like "phrasemongers", "pulsates", "colossal", "enthralled", "luminous", and "authentic vitality". These are the kinds of words that one might expect to see used by a public speaker or a writer. This is at odds with other characterisations of him as favouring simplicity, and not considering himself to be a great orator. 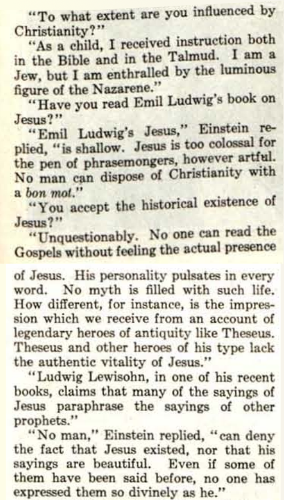 When Viereck brings up Emil Ludwig's book on Jesus, it is as though Einstein is thoroughly familiar with it. This seems surprising, as it had been published only about a year before, and books on Jesus aren't exactly uncommon - it strikes me, at least, as a rather striking coincidence that Einstein had read the very book that Viereck introduced, and was confident enough in his opinion of it to reject it as "shallow", implying careful study and consideration. This, during the height of his fame and his research. "The meaning of relativity," he said, "has been widely misunderstood. Philosophers play with the word, like a child with a doll. Relativity, as I see it, merely denotes that certain physical and mechanical facts, which have been regarded as positive and permanent, are relative with regard to certain other facts in the sphere of physics and mechanics. It does not mean that everything in life is relative and that we have the right to turn the whole world mischievously topsy-turvy." Aside from the "mischievously topsy-turvy", which doesn't sound like the kind of language a non-native speaker would use, this description is not an accurate portrayal of relativity at all. Indeed, it's quite the opposite - relativity does not say anything about facts being relative to other facts, but that those "physical facts" (the laws of physics) are independent of observer. The statement, supposedly by the man who created the special and general theories of relativity, sounds more like the way that a layman might interpret it after having read a newspaper article on it. I tried to secure an explanation of the fifth dimension. I regret to say that I do not remember the answer clearly. Einstein said something about a ball being thrown, which could disappear in one of two holes. One of these holes was the fifth, the other the sixth dimension. Einstein would have balked massively at such a description - this does not in any way represent what a dimension is in mathematics and physics, and the supposed explanation sounds more like the lay ideas of "dimension" as used in scifi to refer to "parallel universes". Schrodinger has discovered the mathematical formula for the fact that all life moves in waves. This is not at all what Schrodinger's equation is about - it certainly doesn't talk about life. Again, it sounds like the usual lay interpretation. The following explanations of Heisenberg and Planck sound similarly distorted. And then, at the end of "page 114", there is a quote attributed to Einstein where he tells the story of the "toad and the centipede"... which is miraculously perfectly constructed to work in print with phrasing like "as follows:". "I believe in intuitions and inspirations. I sometimes feel that I am right. I do not know that I am. When two expeditions of scientists, financed by the Royal Academy, went forth to test my theory of relativity, I was convinced that their conclusions would tally with my hypothesis. I was not surprised when the eclipse of May 29, 1919, confirmed my intuitions. I would have been surprised if I had been wrong"
Not only does this description sound like what a journalist or writer would say, rather than what a scientist would say, it seems implausible that Einstein would feel the need to date the (at that time) famous eclipse (that made him an overnight celebrity), nor would he describe it as "confirming" his "intuitions" - it would be "supported my hypothesis" or "validated my theory", or other such language. Besides, why would he feel the need to specify who financed the expedition? The interviewer, George Sylvester Viereck, is described as "one of the major pro-Nazi propagandist" in the US (note that the important term, here, is "propagandist", not "pro-Nazi"). He was also a well-known poet. The language in the interview sounds much more poetic than other language used by Einstein (as seen in other quotes), and seems to contain scientific inaccuracies that Einstein is unlikely to have used, even when explaining to a lay person. Essentially, in the absence of any corroborating evidence for the interview, and with so many reasons to consider it suspect, I'd call the claim that Einstein said it to be "questionable". If you feel that one of the unreferenced statements requires a reference, please let me know in comments - references were provided for what I considered the critical points, but I may have missed some essential instances. As some people seem to be misinterpreting what the above is demonstrating, I'm adding this little bit at the end. What it demonstrates is that there is reason to doubt the quotes as being Einstein's words. This doesn't mean there was necessarily no interview, but it does mean that, assuming the interview happened, Einstein's language may have been altered in some way (whether intentionally or accidentally). They didn't have the kind of pocket recording devices we now have access to - it's possible that Viereck was simply taking notes as he talked, and then reconstructed the interview, taking liberties as he did so. Those liberties would represent a version of Einstein's words that have been filtered through Viereck's personal biases. It's also possible that much of the content of the interview was legitimate, but that a few bits and pieces were fabricated (Viereck was, after all, a propagandist). Or perhaps the interview was actually conducted in German, and Viereck translated it with some extra flourishes that give a false impression in English. Or maybe the interview was entirely fake. It is unlikely that we would be able to either confirm or deny that the interview happened - but the above does seem to suggest that the article's quotes were not word-for-word accounts of what Einstein said during them. And while Einstein may have been alive at time of publication, this does not mean he necessarily knew of what the article said, or cared enough to correct the record, and it's not unusual for celebrities to ignore false claims because to do otherwise would draw more attention to them. Not to mention that the lack of surviving evidence that Einstein repudiated the claims does not mean that Einstein did not repudiate the claims. My reasons to doubt the veracity should be taken as reason to doubt that Einstein spoke those words - nothing more. Update: it turns out that there's one more source that is relevant, that makes a claim that some interpret as confirmation of the words themselves. In Einstein - A Life, by Denis Brian, published in 1996, it is apparently claimed (reference to another site that claims that the book says it - it's supposed to be on pages 277-278, if someone cares to check it) that Einstein was shown a clipping from a magazine that contained the quote, and after reading it carefully, his response was supposedly "That is what I believe". There are two things about this that complicate matters. First, I can find no indication of the claim that he said that from anything earlier than 1996, more than 40 years after his death. Second, even if we take it to be true, it doesn't confirm the original quote, only the overall sentiment. Indeed, it could be argued that it disproves the quote itself, as Einstein would likely have said "That is what I said", instead. Note that I do not actually argue this - the new quote is too vague to determine the intention, and one cannot rule out Einstein responding instead to the unasked question "Is this really what you believe?" rather than "Did you say this?" I'm unable to find a reasonable source to confirm what the Denis Brian book says, or whether a reference or other identifying information is provided. As it stands, I do not even know when this event was supposed to have happened. Unquestionably. No one can read the Gospels without feeling the actual presence of Jesus. His personality pulsates in every word. No myth is filled with such life. Although, this quote is often used out of context to mislead readers. Einstein does not claim belief in Jesus as a theistic God, but rather as a real historical figure of religious importance. Yes, he most likely did say it in a 1929 newspaper interview (see Morgoth's answer). The interview happened, it isn't unlikely that he said this about Jesus, the background of the reporter has no impact on the veracity of the quote, the quote has been used by reputable sources and most of all: the quote (or at least the spirit of the quote) has been verified by Albert Einstein himself. What humanity owes to personalities like Buddha, Moses, and Jesus ranks for me higher than all the achievements of the enquiring and constructive mind. If the believers of the present-day religions would earnestly try to think and act in the spirit of the founders of these religions then no hostility on the basis of religion would exist among the followers of the different faiths. Disclaimer: I personally think this shows that Albert Einstein - as a humanist - greatly valued the lessons of spiritual leaders such as Jesus and thereby making the quote slightly more believable. I also have to point out that - like other answers here - I could be victim of my own bias and cherry picked these quotes to make them fit my narrative better. I let the reader judge for himself. Glen O has mentioned that the reporter was a Nazi Propagandist. If you read his biography by Phyllis Keller (see Glenn O's answer), you'd see that he was making propaganda for his political views and his political views alone (i.e. no religious propaganda). If you read the biography there is nothing that suggest he might even had an religious agenda, on the contrary, his sexual orientation and Nazi sympathy could even suggest he wasn't religious at all. Gradually, opportunities revived for his journalistic talents - especially his flair for sensationalism - and he became a popular writer for the Saturday Evening Post, the Hearst papers, and Liberty magazine, which he served as an advisory editor for ten years. He specialized in writing anti-Communist articles and in interviewing prominent European figures. Some might say that because Viereck also had the "scientific" portion of the interview wrong he might have got other parts "wrong" as well. This is clearly a non sequitur. In Viereck's biography there is no mention he had any deep knowledge of the subjects of math and physics, so it is more than logical that he isn't capable of reporting correctly on those subjects. An apocryphal Einstein quote: if you can't explain it simply/correctly, you don't understand it well enough. Blackwood handed Einstein a clipping from a magazine in which he had answered three questions as followed: To what extent are you influenced by Christianity? "As a Child I received instruction both in the Bible and in the Talmud. I am a Jew, but I am enthralled by the luminous figure of the Nazarene." Have you read Emil Ludwig's book on Jesus [a popular book everyone was reading and discussing at the time]? "Yes. But Jesus is too colossal for the pen of phrase-makers. No man can dispose of Jesus with a bon mot." You accept the historical existence of Jesus? "Unquestionably! No one can read the Gospels without feeling the actual presence of Jesus. His personality pulsates in every word. No myth is filled with such life". When Mr. Blackwood asked if the article was accurate, he read it carefully, then answered, "That is what I believe". Disclaimer: I don't have the actual book. I pieced the parts together using the Amazon Search Inside the Book function. While writing this answer I found many Christian sites citing this quote and thereby "concluding" that Einstein was secretly a Christian. The only thing Einstein actually said is that while reading the gospels he felt Jesus was a real person. He never said he believed in the miracles written in the Gospels or any other Bible story. Not the answer you're looking for? Browse other questions tagged quotes albert-einstein jesus-christ .